Evaluation and rehabilitation of building facades must take into account the condition of the underlying structure if repairs are to be effective and the results durable. 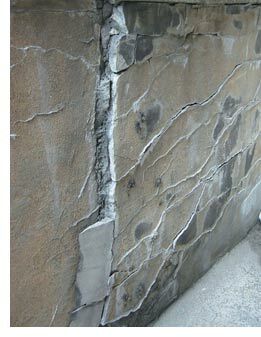 Exterior deterioration may be symptomatic of more serious problems. These may include water damage that has compromised the integrity of the structure or material components. Detailed investigation may uncover damage from use, aging, nature's elements, inadequate original design or under-specification of structural members, or that the structure is nearing the end of its useful commercial life. Examination and Analysis - A thorough examination by FacadeMD includes visual, mechanical and even laboratory testing of building materials, structural or facade components and architectural decoration or fascia treatments. A comprehensive analysis typically includes review of original construction plans and documents, later building updates and repairs and pertinent maintenance activities. Reports and Filings - FacadeMDexamination reports and filings are designed to provide the owner/manager/agent with professional and technical documentation pursuant to the making of informed financial decisions, complying with required building examination statutes, and prioritizing repairs of discovered conditions. When the local building authorities require periodic exterior condition filings, clients may depend on FacadeMDto be conversant with code requirements and the necessary procedures. Even where municipal statutes do not mandate examinations, owners/managers may find condition surveys in their best interest. Scheduled professional surveys serve to prolong the useful economic life of the building and document good corporate citizenship. Expert Testimony - As trained professionals with wide industry experience, FacadeMDTeam members may be called as expert witnesses to testify with regard to specific properties and general industry practices in their areas of expertise. FacadeMDprocedures emphasize respect for accuracy, clarity, documentation and professional responsibility in the event of such need.